I feel loss of appetite, pain in joints and suffer from a sleep disorder. There are times when I don’t feel like taking medicines,” says 41-year-old Nemvung, a resident of Churachandpur town in Manipur, who is suffering from multi-drug-resistant tuberculosis (MDR-TB), which is a more deadly form of TB and the intensive treatment process is accompanied with severe side-effects. In 2013, Nemvung was detected with MDR-TB. She began treatment in Imphal, but dropped out because of the distance—the hospital was 65 km away. 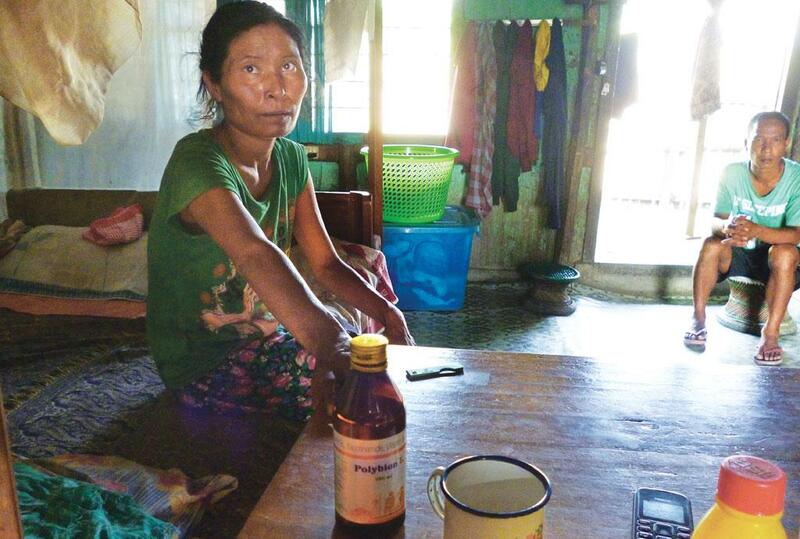 When her condition worsened later that year, she went to a private clinic in Churachandpur, but dropped out once again as she could not afford the medicines. An understanding doctor directed her to a clinic of Médecins Sans Frontières (MSF). The TB division of the Churachandpur District Hospital and MSF have come together to create a model to treat patients afflicted with MDR-TB. The hospital has opened a specialised ward to admit patients, while MSF gives individualised treatment to patients at home. This arrangement solves two problems that afflict TB patients in India—non-compliance of patients for medication and generic treatment for MDR-TB. The initiative comes at a time when MDR-TB cases are on the rise across India. The number of MDR-TB cases increased five times from 4,297 cases in 2011 to 23,325 cases in 2013, said the then Union Health Minister Harsh Vardhan, while replying to a question in Parliament in 2014. Data compiled by MSF, however, says there were about 35,000 MDR-TB cases in 2014, but only 20,000 were being treated. Yet, the Revised National Tuberculosis Control Programme (RNTCP) “claims” to have covered the country through its Directly Observed Treatment, Short-course (DOTS), an international standard for TB control. One way to check for drug resistance is the 350 Gene Xpert machine, which conducts Cartridge-based Nucleic Acid Amplification Testing (CB-NAAT). It is believed that this latest technology has better sensitivity than the traditional smear microscopy test and produces results within hours. Most hospitals, including the one in Churachandpur do not have this facility. The existing technology, which uses culture as methodology, takes many days to deliver results. In the MSF-district hospital initiative, patients can either approach the MSF clinic or the district hospital. If they have failed the first line of treatment either during or before going to them, they are treated through the Gene Xpert technology at the MSF clinic. While the district hospital admits patients for the initial period, MSF employees ensure that none of them miss their dose of medicines at home. Interestingly, there are only 300 such machines in the country, and the government has sanctioned 350 more, says K S Sachdeva, head, Central TB Division, Union Health Ministry. A vital component to treat MDR-TB cases is the creation of specialised wards. In 2012, the RNTCP strongly recommended the creation of such wards, but in most hospitals they are yet to be implemented. In the MSF-district hospital initiative, district doctors analyse needs of the patients. If they think that the patient’s condition is very serious and demands constant vigilance by the doctor, the patient is admitted to the MDR-TB ward. The patient is also admitted if the doctors think that she will default. A patient needing training in food and nutrition is also admitted for a short duration. MSF’s staff goes door-to-door to deliver the medicines to patients who have to be treated at home. “It is tough to create a MDR-TB ward,” says T Pumzathang, district TB officer in Churachandpur, where a specilised ward has been created under the initiative. The deadly strain of MDR-TB is the reason. A MDR-TB ward must have Air Infection Control in place and must provide training to workers due to high infection rates. The wards need space too—each bed must be separated by a distance of at least 182 cm. “I always feel sick. I get fever and cough, which makes me feel lethargic. I have also lost weight,” says Lianching, who stays barely one km away from Nemvung’s house in a shack. Lianching stayed with her family till 2010, when she was detected with MDR-TB. Or take the case of Samte, 53, a resident of Sugnu village bordering Churachandpur. Samte contracted TB, but defaulted on the treatment twice. When his condition worsened the third time, he tested positive for MDR-TB. The problem is that the first test for resistance against Rifampicin is inefficient as most patients are resistant to it. Current treatment programmes also do not check for resistance for an important therapeutic class of drugs—fluoroquinolone. It is a drug given to almost all patients found positive for MDR-TB. If one is resistant to it, alternative medicines can be administered. Given the current state of RNTCP, patients with fluoroquinolone resistance are detected only after a couple of months. “RNTCP has a generic treatment for MDR-TB patients. Only when a patient does not show improvement, medicines are prescribed and individualised treatment begins,” says Leena Menghaney, head, MSF Access Campaign. Unlike government facilities where test for resistance to only two drugs is possible in the first line of treatment, the MSF clinic tests for multiple drug resistance through Gene Xpert technology. This prevents patients from being administered medicine that they are resistant to. Timely testing for any kind of resistance also helps in individualised treatment. Today, Lianching, Nemvung and Samte are on different types of medicines and they receive individualised treatment through the MSF initiative. “Within the public sector, there is heavy dependence on an insensitive diagnostic test, microscopy of sputum, which cannot diagnose drug resistance,” admits a report of the Joint Monitoring Mission 2015 (JMM-2015) of the Union Ministry of Health and Family Welfare. For instance, 40 per cent of the total budget of RNTCP is spent on MDR-TB. Worse, RNTCP treats patients without knowing their specific resistance profile. RNTCP uses single-drug formulations to be administered thrice a week, even though patients are required to take seven to eight anti-TB medicines on alternate days of the week, says a MSF policy brief. The World Health Organization (WHO) recommends a daily dose of Fixed Dose Combination (FDC), which is a combination of two or more drugs. Though RNTCP accepts the benefits of daily FDC, its implementation is yet to take place. The last round of tenders for TB drugs, issued in September 2014, did not include FDC formulations. Experts recommend the Bangladesh regimen, which was recently approved by the WHO. The treatment, which was first tested in 2010, is a combination of new drugs. It lasts between nine and 12 months, compared to the current treatment of 24-48 months. The cure rate is 82.5 per cent, which is closer to the current cure treatment rate. The treatment is cheaper too and has less potential to default in the long-run. It is time the Union government coughs up some meaningful prescriptions if it is serious about public health.